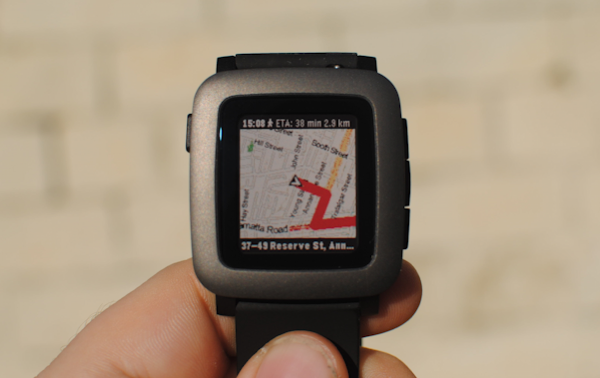 MapsGPS for Pebble (formerly known as PebbGPS) is the original and best way to experience maps and turn-by-turn directions on your Pebble smartwatch if you have an iOS device. 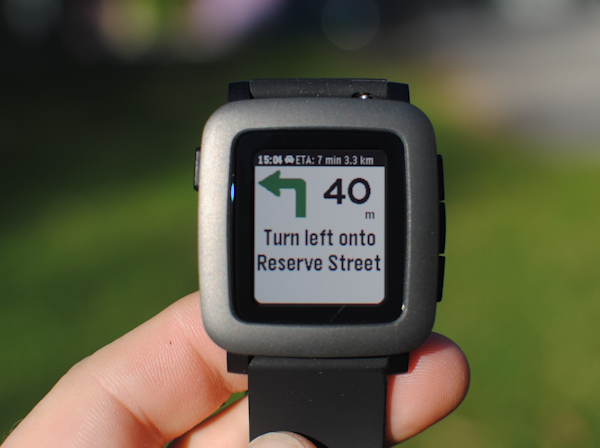 The maps that MapsGPS displays are optimised for whatever type of Pebble you own: Black and white maps for the original Pebble and Pebble Steel, or colour maps for the new Pebble Time and Pebble Time Steel (coming very soon!). Need to get somewhere? Set a destination in the iOS app in the Directions section by holding to drop a pin, selecting an existing contact, or entering something in the search field. MapsGPS will automatically determine a route from your location to where you want to go and send that information to your watch. Press up on the watch to display the turn-by-turn arrow and the next instruction on your route rather than the map, or press down to show a small map and the turn arrow together. "Which way is up again?" Some people seem to just always know which direction is north. 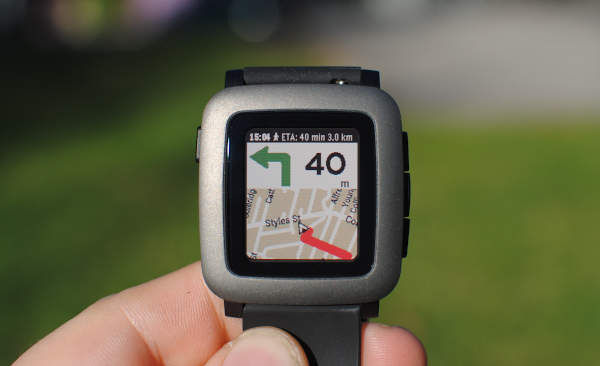 Most others don't... but luckily the Pebble comes with a built-in compass. If you turn on compass rotation in MapsGPS (either in the iOS app settings, or directly from the watch), the map display will rotate to whichever way you are facing, so you can be sure whatever is in front of you will always be "up". Set up MapsGPS to work the way you want it to. Buzz before a turn (one buzz = left, two buzzes = right). Or switch your map style by choosing a different map type (such as terrain, satellite, hybrid and standard streetmap) or by swapping map source (between Google and MapQuest). Or change your zoom factor directly from the watch by hitting the middle button. You decide. Please note, there is a current bug in the interaction between the Pebble Firmware and iOS 9.x that sometime affects Bluetooth connectivity in MapsGPS. This does not affect all users, but if it does affect you, you can regain connectivity in MapsGPS by: 1. Hitting connect ONCE when you launch the app (this makes it try to connect). 2. On your phone, go to Settings -> Bluetooth and choose the Pebble connection (the non-LE one) and hit the info button at end and choose disconnect. 3. If you switch back to MapsGPS now, it should have automatically reconnected and work now. Pebble are aware of this bug and I am also looking for solutions. There's a song playing on your iPhone. 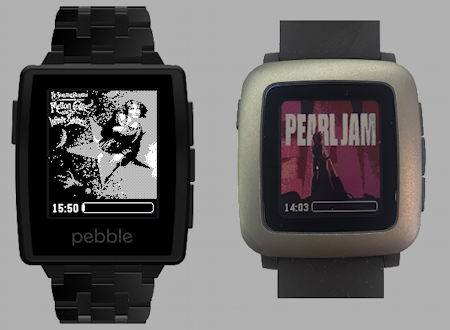 Wouldn't it be great to view the currently playing album artwork on your Pebble? SongView can help. It uses adaptive smart algorithms to optimise the picture for whichever Pebble you have, so you can always display your artwork as well as possible (colour support on the Pebble Time coming soon). A progress bar on the bottom of the screen lets you know how far into each song you are. 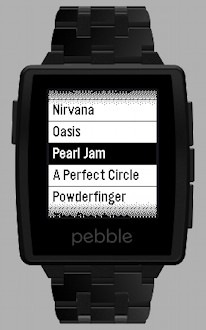 SongView for Pebble can navigate the music library on your iPhone and allows you to select a particular playlist, artist, album or even song you want to play, right from your wrist. Or select Shuffle All and see what starts playing! There's lots of times you might quickly want to try remember the name of the song currently playing, or the artist or album. With SongView, that's just a flick of your wrist away, as the watchapp displays all this information and returns to the artwork view automatically after a few seconds. Or just hit up to switch to this view at any time if you want it to stay visible. Like the built-in music app on your Pebble, SongView allows you to control your music with a few simple button presses on the watch. Play, pause, skip to next song, skip back, and volume control are all possible. Hi, my name is Nathan Oates and I'm located in Sydney, Australia. 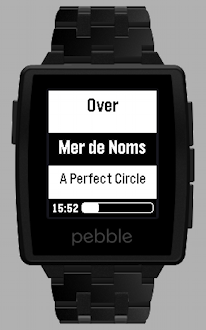 I've been writing Pebble apps since the original Pebble came out, and I have previously released some Mac apps too (if you are interested in finding them, please email me). Though programming is not my day job, I love to hear from users if they have any suggestions or problems (though hopefully not the latter! ).